They call it the “rip-off” clause. 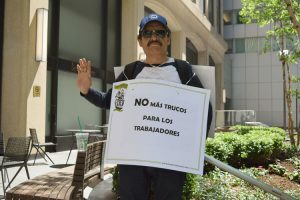 New York lawmakers and worker advocates rallied in midtown Manhattan on May 18 to protest the practice of forced arbitration by large corporations, which they said exploits low-income workers and consumers. In forced arbitration, a company requires a worker or costumer to agree up front to resolve any problem through an arbitration process, waiving their right to go to court. This severely limits the recourse workers have if the company commits fraud, wage theft, discrimination or other abuse. “Forced arbitration needs to be stopped,” said Danny. Advocates slammed this practice as the “rip-off clause,” stating that most workers are forced to sign paperwork at time of hire, waiving their legal rights. 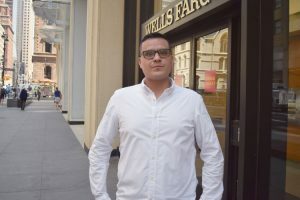 The group staged its rally outside of a Wells Fargo branch on Madison Avenue, and criticized the bank for forcing victims of its 2016 account scandal, in which Wells Fargo opened millions of deposit and credit card accounts without customer permission, to resolve claims against the bank through arbitration. City Comptroller Scott Stringer, who attended the rally, said new legislative proposals in Albany would help ensure companies like Wells Fargo stop taking advantage of the public. 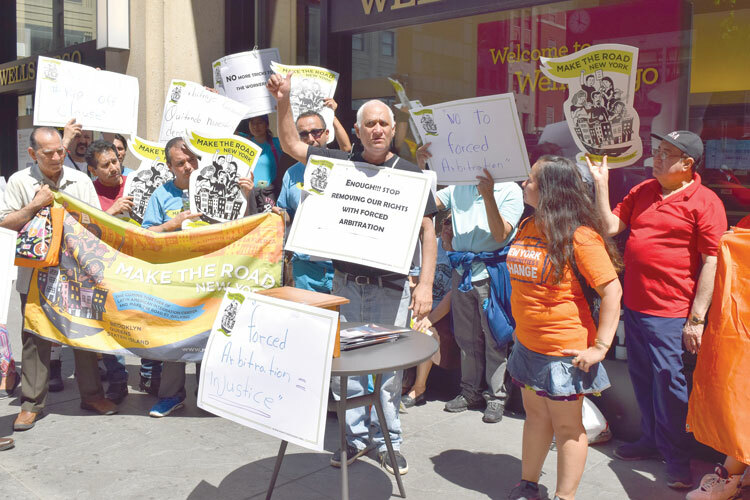 Deborah Axt, Co-Director of Make the Road New York (MRNY), explained that most workers, many of them immigrants who might have limited understanding of English, are not even aware of what they are signing. At the rally, advocates were joined by Assemblymembers Latoya Joyner and Brian Kavanagh, New York State Senator Brad Hoylman, Public Advocate Letitia James and Stringer. Joyner, Kavanagh and Hoylman announced that they will introduce state legislation to would extend the reach of public enforcement of worker and consumer protections. The EmPIRE (Empowering People in Rights Enforcement) Worker Protection Act would seek to extend the reach of public enforcement of worker and consumer protections, in an effort to account for the fact that forced arbitration is decimating workers’ and consumers’ ability to access the courts in the face of wage theft, discrimination, fraud and exploitation. “We have to do everything we can to protect workers,” said Assemblymember Latoya Joyner. “It’s important to remember that the arbiter is usually someone who is selected by the company,” said James. 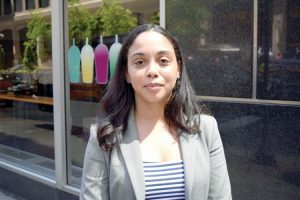 James said she is introducing two bills in the City Council — one that would require any business that deals with the city to clearly disclose whether they subject workers to forced arbitration, and another that would prohibit businesses using forced arbitration clauses in employee contracts from receiving financial assistance or contracts from the city. Worker Danny said he was hired by Macy’s in Douglaston, Queens and worked as a sales associate for more than six months, earning recognition for job performance. However, he said he was abruptly fired, with Macy’s stating that he was terminated due to a prior conviction seven years earlier. “I divulged all of that when I was hired, yet they allowed me to work there for over six months,” said Danny, who explained that he sought help from an attorney, but was unable to take Macy’s to court for discrimination. “I hadn’t known that when I went for the job, I signed a forced arbitration agreement, which I had no idea about,” he said. 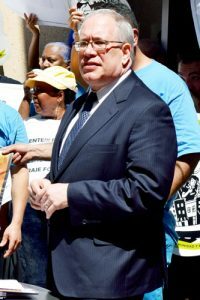 “We’ve got to expose the people who are not good advocates,” said City Comptroller Scott Stringer. Cavanaugh said that consumers are exploited by forced arbitration as much as employees. Stringer said the proposed bills would help level ensure companies like Wells Fargo stopped taking advantage of the public. 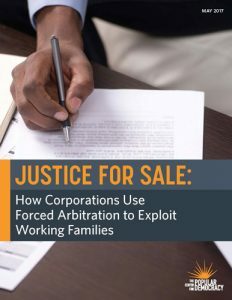 The protest coincided with the release of report by the Center for Popular Democracy, titled Justice for Sale: How Corporations Use Forced Arbitration Agreements to Exploit Working Families, which stated that workers in forced arbitration cases win only about 20 percent of the time, with median damage awards of around $36,500, compared to $176,000 in federal court employment discrimination cases and $85,600 in state court. The report also indicated that in cases related to credit card opening, consumers win arbitration cases only about 6 percent of the time.